Our journey of discovery is moving towards its final stage. We are now going far beyond values-based consumer research and beyond personality, and entering a ‘new world’ of research into power and the way it is used by individuals and groups. This is an area that is often neglected in many commercial organizations so little data is available from mainstream market research companies. Service-based organizations, especially political ones, are currently struggling to understand how to recognize those small changes in their supporter base that lead to unexpected dynamics - of support or desertion. Change is often slow in mass markets or mass movements, so rapid change - stimulated by a change in conditions not previously relevant to their target groups - seems to be coming ‘out of left field’. They are often unprepared for, or disparaging of, these new opinions and/or attitudes. They seem to be coming from individuals and groups of individuals who seem to be out to destroy all that their organization has valued and developed over many years. This part of the series will examine a group of people who have disproportionate influence on others, whether within small groups in the work place or who have culture-wide effects on entire political systems. These individuals will usually have a range of characteristics that are socially valued and which they tend to carry off with a style – a ‘charisma’ if you will - that others ‘like’; yet they themselves may be so self-centred they become an anathema to their loyal followers and end up subverting their own influence. This area has not traditionally been the stuff of market research, which has tended to stay within the confines of behavioural and attitudinal research. At CDSM we enjoy asking better questions - exploring the boundaries of research - and though positive psychology and happiness research has been promoted as ‘the latest thing’ we felt many of its insights had already been covered with our own values-based models and those developed by Schwartz, as well as the OCEAN and HEXACO models we’ve previously tested and applied. The real challenge for us was to try to discover the significant factors that led to people holding values and motivations defined by Social Dominance Orientation. We call them BOTUs for short – or bastards of the universe. We wanted to know why some ‘good’ people do bad things - and why we let them. Clinical psychology has been studying this issue for over 100 years and there exists a significant body of research-based evidence to identify why some people are ‘charismatic’ but ultimately unhappy with their success. People who are unhappy are unlikely to be ‘leaders’ despite needing the limelight. Yet other ‘charismatic’ people, displaying the same attitudes and behaviours, are extremely content. This research would supply the beginnings of the answer to our new question. We wanted to know about charismatic people who displayed characteristics that made them either great leaders, or criminals and social deviants. These are the people who others almost instinctively recognize as something special – but treading a fine line between light and dark. could create greatness for their organizations and then crash them. could perform extraordinary feats but have no follow up plans. could inspire others – but not feel the pain they caused their followers. It is important to understand these people and try to identify them in terms of numbers in the workplace and in society so that they can be used most effectively – working to their strengths but modifying or changing their negative impact on others. Based on the analysis of our research into HEXACO, a lot of reading of academic papers and discussions with experts in the UK and Canada, we concluded that the best way to begin research on our new question was to understand what happened in British Columbia, at the University and at prisons in the area. Primarily we were interested in the work of Delroy Paulhaus and his work on the Dark Triad, and Kent Kiehl and his work with psychopathic prisoners in the province. The Dark Triad is the combination of Machiavellianism, Narcissism and Psychopathy (MNP). These three psychological factors had previously been conflated in research and diagnosis within the clinical field. Since 2002 Paulhaus and his students have contributed greatly to our knowledge by developing a clarity of definition of each factor that today allows us to test for each individually. It is this clarity in identifying the differences between factors that allows CDSM to test scales measuring them among our general population studies; to move beyond the small, self –selected or interviewer identified control samples so useful in primary research, but limited in terms of organizational analysis and cultural impact studies. In 2013 we tested the scales on 3,000 British adults for the first time. We used the British Values Survey for these measurements. The BVS included hundreds of other questions that helped us get inside the minds of people who had high scores on the three scales relative to the rest of the population. 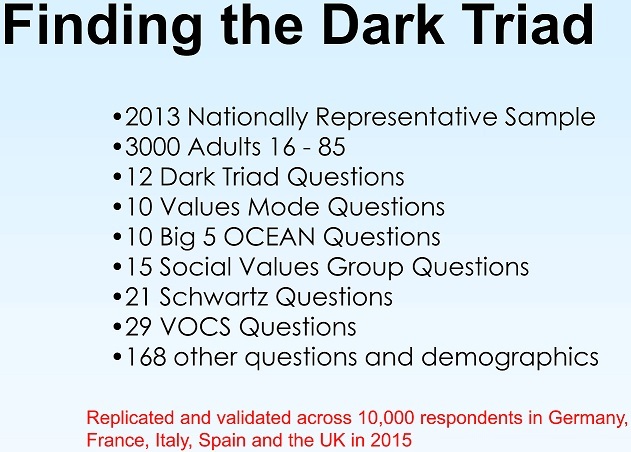 This chart shows that in addition to questions measuring the Dark Triad (using a short list developed by Jonason, et.al.) we also asked CDSM model questions (three different models), OCEAN questions and Schwartz questions. In addition to that we asked a range of questions about attitudes to work that produced a separate model. All of these questions were contained within the BVS database and therefore capable of extensive correlational analysis. Our results gave us an insight into why academics had been stymied for many years in clearly defining the factors and in separating them. We found high degrees of correlation between the three factors – and which also set them apart from the general population. Demographically they are very similar. All three are more likely to occur in younger people. Some are more likely in males, or in jobs that are more likely to involve university education and produce high pay e.g. management rather than the shop floor. The differences inside the demographics are significant but tend to be much smaller than differences within values segments. This was unexpected and very illuminating as to the motivations of the CDSM values segments – something we had been looking for beyond the positive psychological data we had developed over the decades. 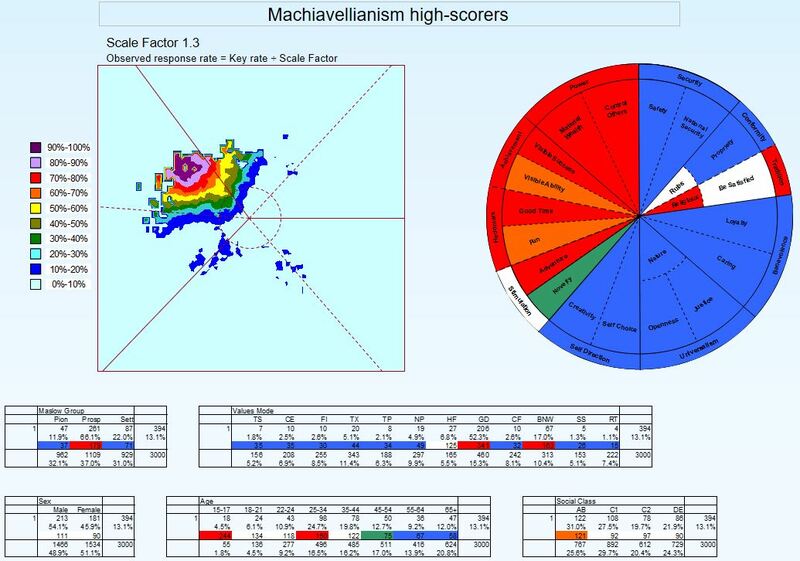 The first significant thing we noticed was the high correlation between the Schwartz segments and the CDSM values space. The Schwartz Values segments measuring Power, Achievement and Hedonism all lit up in the presentation of the data. 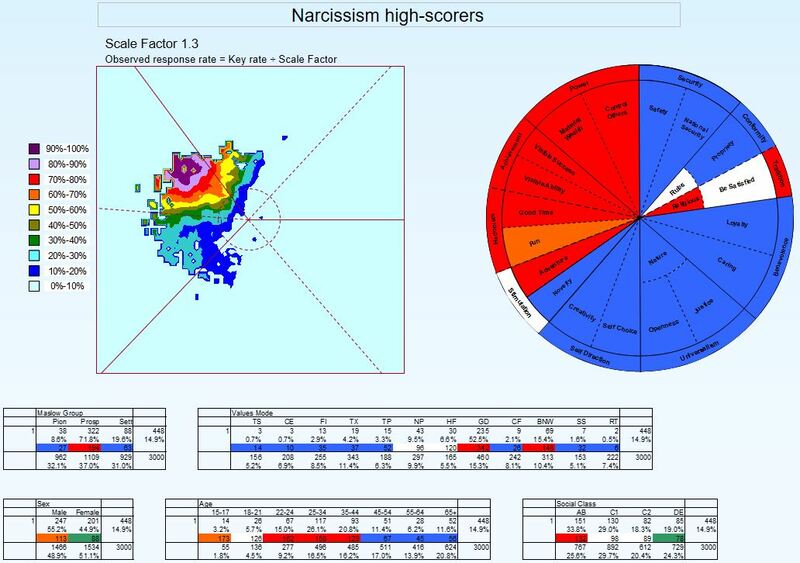 The Machiavellian, Narcissistic and Psychopathy factors in the general population correlated strongly with values held by millions of people. They were outliers (between 13% and 15% in the population) but the mainstream recognized the factors more as virtues than otherwise. Other research had revealed that people tend to like Narcissists and ascribe many attributes to them that aren’t actually true – like being taller than they actually are, or better looking than they are. Machiavellians tend to be judged to be better decision makers than they actually are. These are factors that seem to be driven by the need for these types of people to impose on others, even if subconsciously, their own needs for Power, Achievement and Hedonism. Machiavellians and Narcissists don’t appear to have an adverse effect on most social relations or even a systemic effect on organizational and political systems. They just come across as ‘out there’, fun people – more ‘good time guy’ than ‘home wrecker and heart breaker’. It is the third, closely correlated factor that creates problems for others – Psychopathy. The Psychopaths relative inability to empathize with others and to be unconcerned about their impact on others (as they actively pursue their desires for Schwartzian Power, Achievement and Hedonism) is the real downside of the Dark Triad. This research brings new insight on the Social Dominance Orientation scales that identify many BOTUs. 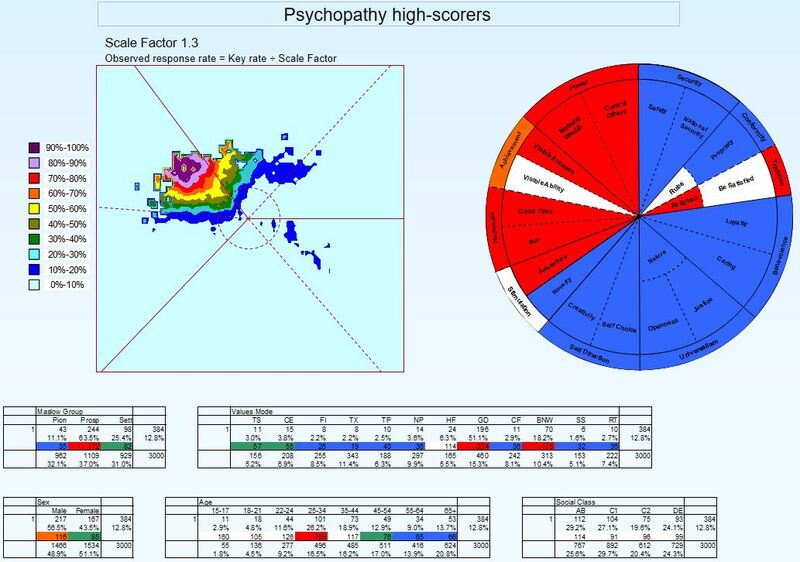 Psychopaths – those scoring high on the subclinical Psychopathy scale - comprise almost 13% of the population - about one in eight of the people walking down any main street. They are evenly spread across all social groups. These people are more likely to be young (under 45) and male – hence ‘Prince’ - although about 43% are female. What this means is that we are all exposed to them on a daily basis – we may even be married to or live with one. If working, we are almost certainly affected by them as they attempt to climb the corporate ladder, or maintain their own position at any cost. This may seem to be a bit overpowering – they are everywhere and not locked up in jails or mental institutions. They tend to be highly sociable but ultimately in situations that they maximise for themselves and not for others. They are often the people that seem to get ahead without actually having done the hard work that others feel is needed to hold the position. These are the people that make comments that seem ‘reasonable’ at the time, but upon reflection can be deeply disturbing. Males are 15% more likely than females. ABs are 14% more likely than the average. C1s are 9% less likely than average. The 25-34 demographic is 59% more likely than average. But the real differentiation is in relation to CDSM values profiles. The POD is 72% more likely to be in the CDSM Prospector Group – and 65% less likely to be in the Pioneer Group. The true value of CDSM Values Modes is shown in highlighting the PODs. The PODs are three-and-a-third times more likely (334%) to be Golden Dreamers. 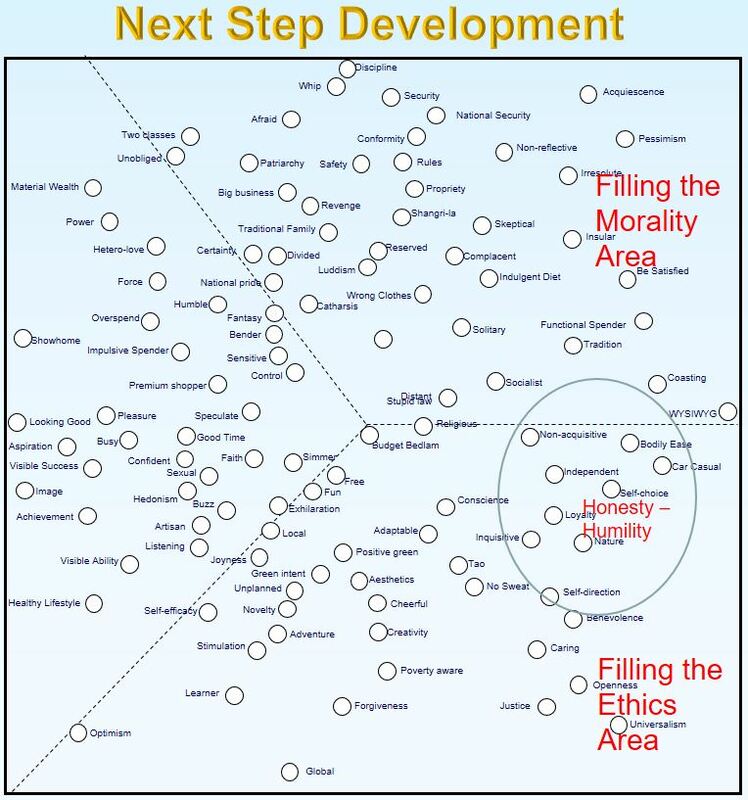 When this is correlated with Machiavellianism (341% more likely to be Golden Dreamers) and Narcissists (342%) this gives a real insight into a wide range of values, beliefs and motivations already known about this Values Mode. The Golden Dreamers are those who have the ‘biggest dreams’ - the people who believe that they have the wherewithal to achieve those dreams but are not too sure exactly how to do it right now. They dream of celebrity, or public recognition of their success – but feel high anxiety when thinking of failure. Rather than believing they can learn from their failures, they feel shame and anger when they fail – and often blame others for their failure. They dream of gold but will use base methods to achieve it. A Golden Dreamer will give it their all (based on all the factors we’ve noted in this series) to make their dreams come true – but they are more likely than most other Values Modes to leave a trail of destruction in their wake. On the surface highly sociable and liked by most, they also tend to polarize people and organizations with their often single-minded pursuit of success. They can rise rapidly in any social organization – from local interest groups to national and international organizations, from mother’s groups to the higher reaches of government. They will often adopt the ‘colours’ of a group to begin with but invariably they will change any group to match their needs. Power feels like something they deserve and it makes them happy when others acknowledge them for having it. They will become dissatisfied when there isn’t enough recognition and, if in positions of power, they will create events that recognize this power – awards ceremonies, trophies, badges, certificates and so on. They realize that this is a zero-sum game – winners and losers – but they will do anything to win, and so if there are losers ‘that is just the name of game, tough luck’. They don’t really care about losers. There is no caring core in these people – there is only a heart of darkness, of dominance at all costs and a lack of empathy for others. These are harsh judgments not often found in most market research – and usually not found in conjunction with consumer research of any kind. But it is vital to understanding the changing dynamics among segments that are used in consumer and cultural research. Linked with the models we have presented so far this is complex data and information that can be found only at CDSM. We’re satisfied with the answers to our questions about Social Dominance. But good answers just lead to better questions. So what is our next question – to be tested for in 2017? We are going to look forward in the next, and final ,section to the reverse of the Dark Triad – almost revisiting our search for Honesty and Humility in HEXACO. But instead of looking for a factor within a model we want to look for a robust model that reliably tests only for morality and ethics – or at least covers only those factors. We’ve identified the model, which has been written about extensively but never tested within CDSM Values space. In Part 6 we will describe the model, describe our thesis, and sum up what we expect it to deliver in terms of insight for us and a potential addition to the range of tools we can offer users in the coming years.